The Original Sky Ski model when we started in 1998, the 2015 Pro SS now features the all new board!! 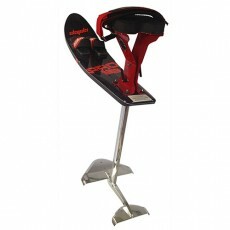 The Pro Model has remained the most commonly sought after hydrofoil for people starting out in the sport of Hydrofoiling! Since bringing it to market way back then we've added many features & enhancements to it to make it more user friendly, perform better and last longer. The Pro Model is versatile enough to learn how to fly, or learn your first flip on. And, just like all of our Sky Ski models & components, the Pro SS is upgradeable. If you decide later on that you'd like to add a Shock or Evolution Tower, or maybe one of the higher end hydrofoils, rest assured they will all bolt right up to the Pro SS components. The solid, reliable, and affordably designed Sky Ski Pro isthe best buy for the beginner who plans on Hydrofoiling for years to come!